This is the latest in mine and my co-worker Kirill’s lunchtime rants, though this particular tirade only he can claim as my morning coffee routine consists of a triple-grande nonfat peppermint latte, no controversial sugar packets required. Prior to this revelation I had yet to investigate this confectionary phenomenon for myself. I must confess it creates a certain amount of bewilderment, as one would consider sugar a relative staple in the coffee preparation routine. However, Starbucks, in either an effort to cater to the more hipster/trendy population or in order to single-handedly tackle hypoglycemia and type-2 diabetes, has removed the offensive pink-and-white packets and left nothing but Splenda, Sweet n’ Low, and “Sugar in the Raw” which, ironically, is merely sugar with a henna treatment. Eco-friendly-looking packets filled with molasses-coated sugar chunks. Marketing FTW. My co-worker, however, will not be swayed. “Because!” (Furrowed brow.) “White sugar dissolves INSTANTLY! The minute it touches your coffee, it’s gone!” (He then proceeds to make vacuum-swooshing-noises and flourishing hand gestures to better illustrate the superior dissolving power of white sugar.) “That raw sugar crap, it NEVER dissolves! It just sinks!” His voice, with it’s slight Russian accent, is getting rather high-pitched and frustrated at this point. I can tell he has very strong opinions about “Sugar in the Raw”. Mercifully, the restaurant we’re having lunch at provides an entire vessel on the table teeming with sugar packets. No Splenda though. Which is what *I* wanted. Bugger. I’ve gotten to the point where I’ve begun carrying Stevia around with me. Yes, I’m one of *those* people. Post-lunch. Cut to: the kitchen, at work, Kirill is relating his coffee/sugar/Starbucks woes to Jerry, our resident tech guru. Or, to be fair, anyone who will listen, really. Some have fled to the relative comfort and safety of their offices. “Isnt the raw sugar stuff better for you?” Jerry asks. Sigh. Poor Jerry. Actually, I think he’s playing devil’s advocate in this case in order to provoke. Which I of course appreciate. Kirill, 27, works full time, is in Grad school, spends his weekends in nightclubs, and weighs about 90 pounds soaking wet. He cares not for such things as ‘health’ and ‘glycemic index’. Jerry, however, is in his early 50’s, an avid cyclist, has a family, and always has the most interesting assortment of unintentionally chromatically-organized fruit of his desk. I’m not kidding. One day everything on his desk will be orange. Or green. It’s fascinating. Or sorted in ascending order by size. I don’t think his coworkers truly appreciate the awesomeness that is the fruit and vegetable artistry that takes place on a daily basis behind Jerry’s keyboard. Anyway, my point is, Jerry might be more apt to show concern towards the glucose content of his beverages. Perhaps you’re beginning to sense a pattern. I know I have. 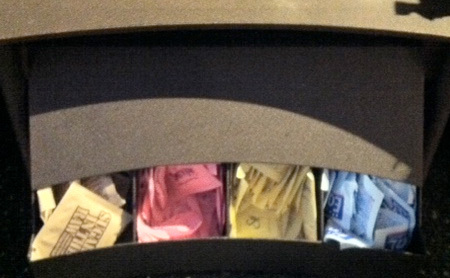 Thanks to my peer’s tirade I began to take stock of the sweeteners offered not just by Starbucks but by any of the cafes I happened to frequent in my neighborhood, which happens to be in and around one of the trendier locales of downtown Seattle. Some even go so far as to offer agave syrup to their patrons. Agave, really? As in cacti? To be honest I’d never considered cactus in my coffee but I suppose it’s no stranger than sweetening your tea with the salivary secretions of honeybees or cutting your Sumatra blend with the breast milk of a bovine when you think about it. Yesterday morning. Kirill storms into my office. Egads. This is never going to end. “I have a NEW strategy! !” declares he. “Is that so?” inquires I. “Throw one away! !” Self-satisfied facial expression complimentary. I need to start closing my office door. Voulez-voulez-vous one lump, or two? A taco can only pull at four (4) knots per hour. My mom used to add about 12 grains of sugar to her tea. 1 packet of sugar lasted her a really long time. This Kirill fellow needs to find about 10,000 packets of sugar on his desk when he returns from holiday break.